THURSDAY: 8 A.M. TO 2 P.M.
FRIDAY: 9 A.M. TO 12 P.M. IF I AM NOT ON CALL. WE USUALLY TAKE LUNCH FROM 1:30PM TO 3:00PM ON TUESDAY AND WEDNESDAY. Even if I am not on call our answering service will answer all calls after hours, or you may call them directly at (970)248-0285. You always have the option of having them page me even if I am not on call, but I may not necessarily have my phone with me. Doctors Twardowski and Fryberger are on call for me when I am not available and the answering service will call for you. 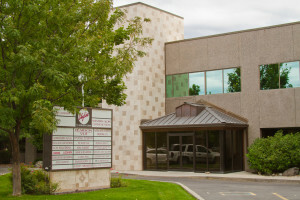 Your other option is to call or present to any one of the many Urgent Care Centers here in Grand Junction and they are listed under the Urgent Care tab. I HAVE PRIVILEGES AT COMMUNITY HOSPITAL AND WILL SEE MY OWN PATIENTS THERE, BUT AT ST MARY’S HOSPITAL YOU WOULD BE SEEN BY THEIR HOSPITALIST GROUP. We are located in the Skyline Building behind WWPeppers. We are on the second floor, an elevator is located just inside the front doors, to the left.